Mexican Baseball includes the winter months of November and December. Mike and I were thrilled to ride to Guadalajara through the Lake Chapala Society in Ajijic. We arrived at the fabulous Charro’s stadium in time to watch the batters warm up. This was our first experience at the new Charro stadium. It was for this final Winter game and we were seated in the VIP section along with the family of the team members. Two van loads of rootin tootin baseball fans from all over the USA stood and cheered “Si Senor” with every base hit! Vamanos Charros!!! The stadium rocked with the legendary song “Take me out to the ball game”. As a member of the Lake Chapala Society you get the benefit of discounts on the tickets as well as access to their online newsletter. It is a wonderful experience! Additionally there are organized bus trips to the Opera, and the Zoo. There is so much to see and do just 45 minutes away from Lakeside. 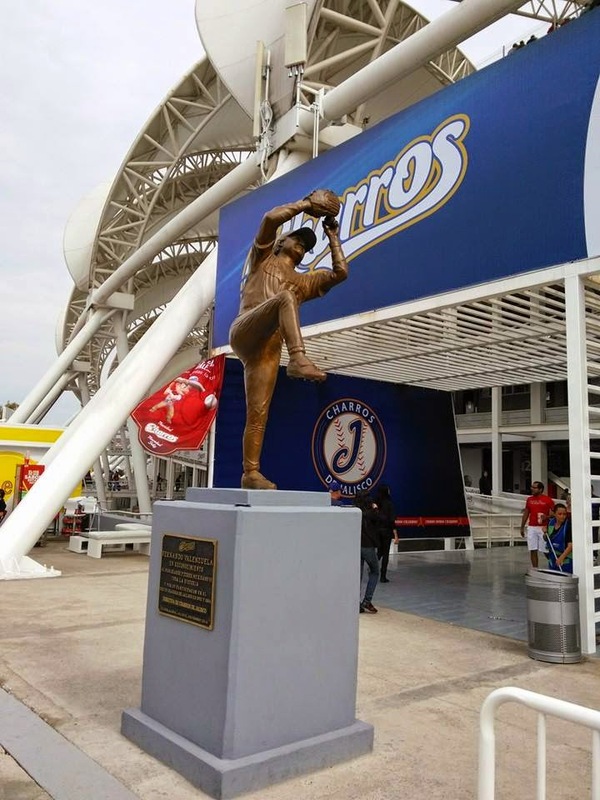 There are many Dodger fans in Mexico because their hero Fernando Valenzuela is memorialized in this bronze statue. Fernando was a Charro before he became a Dodger and today he inspires and coaches the next baseball heroes. The great Mexican pitcher Fernando Valenzuela otherwise known as “El Toro” received a tribute from Charros de Jalisco. The lefty also expressed that he is excited by the homage that the Club has given him. “It is very moving, because when the player is in the sports environment, he seldom perceives what people feel.” On his return to Guadalajara, after a long and successful career in Major Leagues, Valenzuela stressed that he has felt that the fans continue to remember him with pride. The tour buses are air conditioned with first class luxury seating. Catch a game, or travel to Puerto Vallarta – FUN days living in Mexico.